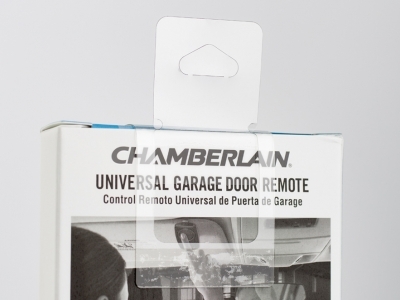 Chamberlain turned to Do-It Corporation for a custom designed R-KHD hang tab for their garage door remote packages. The R-KHD provides display flexibility for Chamberlain’s product. Folded down, the product can be displayed on a shelf or in a bin. Folded up, the hang tab and the remote can be hung on a peg hook or a display strip. Since the hang tab can be folded down, Chamberlain can utilize the original master carton boxes during shipment. Additionally, the clear hang tab can be placed anywhere on the package without blocking product information.